For more than 100 million Americans that suffer from chronic pain, it is more than just an ache or a pain; it can be a life-changing limitation that gets in the way of enjoying daily activities, exercise and time with family and friends. While medication can dull the pain, it’s not a lasting solution and can be hard on the body over time. Beyond that, the side effects can often make you more miserable than the original pain. One effective method of managing chronic back, torso and limb pain is through Spinal Cord Stimulation (SCS). Spinal Cord Stimulation is a pain management technique that uses a mechanical device implanted beneath the skin to sendbrief electrical pulses to specific locations along the spinal cord. These pulses actually mask the sensation of pain before it registers in the brain, reducing the pain for a good percentage of patients by up to 70%. Who would benefit from SCS? If you suffer from nerve pain in your midsection, arms, legs and back, have had a failed back surgery, or deal with other chronic pain syndromes, SCS might be the answer for your chronic pain. SCS is especially helpful for those who don’t respond to other less invasive treatments, or are looking for a more long-term solution. If you think this might be a beneficial treatment for you, contact Dr. Li today for a thorough screening and consultation to determine your eligibility. Imagine you are a candidate for SCS. You come into the office hunched over, every move punctuated by pain. Based on your health history, type of pain and its severity, the doctor deems you a great candidate for SCS. To confirm that you are, your physician places a trial lead underneath the surface of your skin to determine if this treatment will be effective for your pain. If the trial run is successful, the full procedure follows. During your procedure, the skin of your back and buttocks is numbed with a local anesthetic. While you are laying on your stomach, the physician insertsa needle in your back, then thread an electrical lead along your spinal column that are connected to soft, thin wires. Then, a small programmable pulse generator is inserted just below the skin of your buttocks or upper abdomen through a small incision. The physician triggers the generators and the pulses to your spinal cord begin to mask the pain before you even feel it. One to two hours later, you are checked out and on your way home, feeling markedly less pain than when you came in. After the initial procedure, you can adjust the location and intensity of the pulses via a handheld remote that controls the implanted generator as your pain needs increase and decrease. You can use this technique for 1-2 hour periods, several times a day, or as directed by your doctor. Spinal Cord Stimulationis a low-risk, high-benefit treatment plan that offers maximum pain relief with minimal side effects. Because the leads are placed under your skin along with the generator, you can still travel, be physically active, and live your normal live with noticeably less pain. Both the trial and implant procedure are reversible, meaning if you are not satisfied with the pain relief, the wires and generator can be removed without any adverse effects. 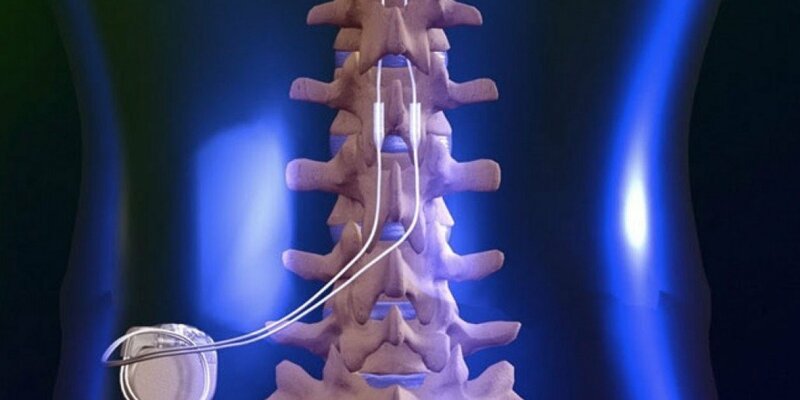 Although uncommon, the reported risks of Spinal Cord Stimulation include infection, technical or mechanical malfunctions, migration of pain center, headache, bladder problems, scar tissue around the lead, and leakage of spinal fluid. Some patients become used to the stimulation and do not experience the same level of pain relief over time, but that can be adjusted via the handheld remote. Also, patients with an implanted generator cannot have magnetic resonance imaging (MRI) tests due to the metallic implant located beneath the skin. After the procedure, you will follow-up with your physician every six months; however, additional appointments might be necessary in the first few weeks to determine the appropriate intensity and location of the pulses, and adjust those as needed for maximum pain relief. Both the procedure and the implantation are fully reversible. Soif you have an adverse reaction, or if the treatment is not the best option for you, there is no lasting impact. Dr. Li can perform a screening test to determine your eligibility for Spinal Cord Stimulation, based on the type of pain, severity, your response to past treatments and other health factors. For more information on Spinal Cord Stimulation for chronic pain, please call our office at (626) 538 – 8950 and schedule an appointment with Dr. Li.